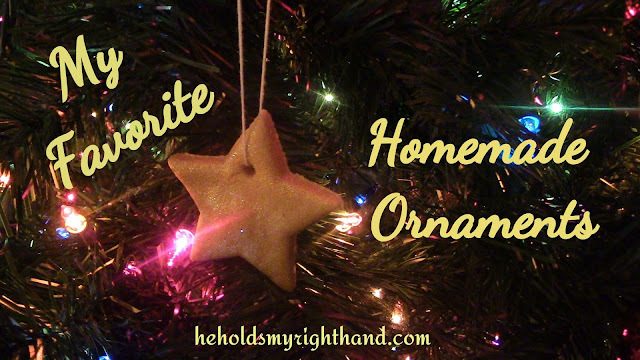 As I mentioned last week, every ornament on our Christmas tree has a story to tell. Some were on our tree when I was growing up, some are homemade, some are store-bought, and some were given to us as gifts. This is only two, out of I think 8, ornaments that I painted for mine and David's first Christmas tree. They are plastic, but are meant to look like stained glass. We didn't have any ornaments of our own yet, so I decided to get an ornament kit and paint these. The kids and I made these salt-dough ornaments in 2005. JJ was almost 3 years old. EL was 7. It was a fun project to cut, bake, and paint these ornaments. We gave some away as gifts that year, and kept some for ourselves. Some dear friends of ours made us several ornaments made of pinecones. They make our artificial tree look a little more real. This photo shows two more homemade ornaments. The one with JJ in the frame was made at the local nursing home several years ago at a Christmas event for children. The round one above it was made in 2004. It has JJ's thumbprint on it, and I added a stick person's body to it, then wrote the words "Thumb body loves you!" I have one that EL made also (not shown), but I made her thumbprint into a flower shape and wrote, "Thumb flowers never fade." We gave these away as gifts that year, and didn't keep any for ourselves, but these specific ones found their way onto our tree after Grandma Mac passed away in 2013. So, they are special because they have the kids thumbprints on them, and are also special because they belonged to Grandma. Thanks for stopping at my blog. I enjoyed seeing all your ornaments. I love the ornaments that have memories attached. Thank you for stopping by here, too! Merry Christmas!